Bobby Maddex interviews Erin Moulton and Jodi Elliott, the president and vice president, respectively, of the Orthodox Christian Translation Society Board of Directors. Bobby Maddex interviews Erin Moulton, Alexandra Weber, and Symeon Magnusson of the Orthodox Christian Translation Society. Glory to God: Is Relationship with God What We Want? Dr. Michael Colburn, the OCMC Mission Specialist in Linguistics and Translations, speaks at the second annual missions lecture at St. Vladimir's Seminary. Fr. Stephen looks at language and how it can be seen as an icon, serving as a "Window to Heaven." Bobby Maddex interviews renowned poet and Orthodox Christian Nicholas Samaras about his new book of poetry American Psalm, World Psalm, published by The Ashland Poetry Press. 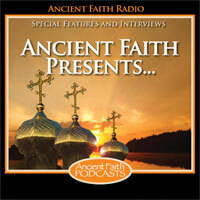 Bobby Maddex: Welcome to Ancient Faith Presents. I’m Bobby Maddex, Operations Manager of Ancient Faith Radio, and today, I’ll be speaking with Erin Moulton and Jodi Elliott, the President and Vice-President, respectively, of the Orthodox Christian Translation Society Board of Directors. Erin and Jodi, welcome to the program. Erin Moulton: Thank you so much for having me. Jodi Elliott: Yeah, it’s a pleasure to be here. Bobby Maddex: So, why don’t we start with the most obvious question. What is the Orthodox Christian Translation Society? Erin Moulton: Well, just quickly in a word, we are a non-profit organization committed to cultivating translations of Orthodox works and sharing them with the world. So, we are primarily interested in really sharing the Orthodox experience and spiritual wisdom across linguistic boundaries and cultural boundaries with the vision of being able to use the tool of translation in order to be able to increase our communication and even our community as a worldwide Orthodox community. And I suppose in the interview we can get into more details of our vision about how that will work. Ultimately, that’s the vision for what this organization will do and already is doing. Bobby Maddex: Alright, well who started OCTS, and what was the inspiration? Jodi Elliott: Erin actually is the one who started it, and Erin and I met each other almost twenty years ago when we were in college. We both had international interests. She studied abroad in Russia. I studied abroad in France. And very early on, in our young adult lives, we were having experiences in an Orthodox world that were very different from Orthodoxy in America. And as we were having those experiences, time and time again, we came across situations where translations of Orthodox texts were necessary, and we even found that there were people qualified to do such translations, but there was no money to pay people to spend their time to do translation. So Erin realized that a good idea for an organization would be to pair up people who are interested in donating, to have this work done, with translators who are qualified to do the work. And so that was the original idea, and when she approached me with it, I thought it sounded fantastic and the rest is history. Bobby Maddex: How do you decide on which manuscripts or which texts that you’re going to tackle, that you’re going to try to translate. Erin Moulton: That’s a great question, and to be honest with you, one that we sort of fought through and wrestled with for several years, because this organization has been several years in the making. We’ve taken some time to really carefully consider a good way to make this happen. So really at the core, our plan for Orthodox Christian Translation Society is that it would be translator-driven. In other words, people who are qualified to translate; who have experience doing translation work, you can automatically assume somehow have their foot in two different cultures, in two different languages, and then probably parts of the world, and so often there, the people who know that texts are out there that would be useful to share between cultures. And so, the way our organization works is that translators can come to us and make a proposal of a text that they think needs to be translated and that they would like to translate; that that person themselves has some interest or expertise to be able to do that work. And so the starting place is that translators come to us with proposals, and we’ve actually just completed a round of receiving a number of proposals from various translators to do some projects. From there, we have sort of a three step review process that takes places, beginning with the selection committee, which is made up of a group of individuals who have expertise both in languages and editing, publishing, and then just in general some good experience in what makes important and good Orthodox works. And so, they review the proposals, both looking at the feasibility of them, but especially looking at the qualifications of the translator and the value and quality of the text. And then, they evaluate the works and send them back to the Board of Directors, just briefly, and then they go to an advisory board. So we have, right now, a relatively small advisory board, and it includes one bishop and one abbess – Bishop Basil Essey of the Antiochian Archdiocese in Wichita and Mother Gabriella at Dormition Monastery in Rives Junction. And they review those texts that have been selected or evaluated by the selection committee to confirm that they are of worth to the Church as a whole and make sure that there aren’t any issues that need to be dealt with. And then the third level would involve, finally, an evaluation that takes place by our Board of Directors to determine the feasibility both financially and in terms of other issues, maybe considering marketing or maybe considering audience, to determine whether it’s feasible to take on that project at this time. So there’s sort of a series of steps that it goes through, but ultimately it’s translator driven. It starts with the translator. Bobby Maddex: You publish, then, these translations, and I’m wondering about the copyright issues. Do the texts that are in the foreign language, are they free of copyright or how do you negotiate that? Jodi Elliott: It’s on a case-by-case basis. Some works are of an age where copyright issues aren’t as big of a problem. Other works are contemporary. So we work with an intellectual property firm, that’s here in Wisconsin, who helps us draft contracts and enter into agreements with the various parties regarding intellectual property. Bobby Maddex: So I understand that you have completed your first translation project, and I’m wondering what that project is and who all worked on it. Erin Moulton: We have actually completed our first project, and it actually will be available for purchase very shortly via our website and also available on Amazon.com. It is a translation of a Serbian work, called Place Your Hope in the Lord, and it is the poetic spiritual life of Father Lazar, who was an abbot of the Ostrog Monastery in Montenegro. The translator is a woman named Milena Taylor, who lives in Serbia, and grew up in Serbia but was actually educated in the United States in Texas. She did her University work in Texas. And it’s actually sort of a lovely story the way we came about this work. We were seeking some possibilities for our inaugural project, and Milena actually just happened on our website and contacted us because she had been working on this project already, but was hoping to find someone to help her work on the editing and publishing and get it out to an English-speaking audience. So we were encouraged to hear from her. But only after we heard from her and began communicating with her, Milena and I discovered that we shared some mutual friends in Kansas, which we didn’t even know about at the time. So we already began working on it, and then discovered that we had a lot in common, in fact, a friend here in Kansas. Deacon Michael Wilson had been talking with her to try to help her figure out what to do next with this project and helped her find our website, not even realizing that it was an organization that I was working with. So certainly, God was at work in pulling together the people to work on this project. And then, just to finish answering your question, we’ve had several different people work on it. The text itself was actually authored by an Abbess Jelena in Montenegro. But we actually had, of course, Milena do the translation, and then we had a member of our Board who has experience in editing, work on the editing of this initial project. And his name is David Twombly, and he put in many hours to help with the editing. And then I helped with that. We also have a few people that have expertise in Serbian who have helped work with that, to help get some of the text clarified. And finally, we have listed the help, additionally, of a layout artist and also someone else to work on cover designs. So we’ve pulled together quite a few people from the Orthodox world to help us pull together this first project, and we’re really excited about that. Bobby Maddex: You mentioned your website several times now. Why don’t you go ahead and give that web address, so that listeners can begin searching for it online. Bobby Maddex: So when will Place Your Hope in the Lord be available for purchase, and where will it be available? Just at your website or on Amazon.com? Jodi Elliott: Yeah, it should be available at the next few weeks. It’s going to be available through our website and on Amazon.com and on Amazon Europe. Bobby Maddex: Alright. So what other projects do you have coming up? Erin Moulton: We actually have several possibilities coming up, and we actually haven’t selected all of the details of those which we’ll be working on. We’re actually considering right now five different proposals, and our selection committee is in the process of reviewing them. They’re rather diverse, and I don’t necessarily want to give out all the details of them until the selection committee has completed their review. But I can say they involve the Russian language, the Serbian language, and also I believe Greek at this point. All of these would be translations into English from other languages, but long-term, we are very eager to see some other kinds of translations happen into and from other languages. So it’s our desire and plan to make this a truly international effort. Bobby Maddex: Are you always looking for new and additional translators, or do you feel like you have enough submissions as it is right now? Jodi Elliott: We’re always looking for more. The more translators, worldwide, that we can be in touch with, the better selections we’ll be able to make, and the more needs we’ll be able to meet. So, we’re always looking for translators to go on our website and to correspond with us. We do put out the open call for proposals every year. Our next one will be coming up next summer. The deadline for proposals is generally October 1st. So, as you can see, we just finished a cycle. But, we welcome communication with translators at any time of the year, to answer their questions and just to get to know each other better. Bobby Maddex: And what about people like me, who have very little facility with foreign languages? If they believe in your work, how can they help support OCTS? Erin Moulton: There are lots of ways that all kinds of people could get involved. The first, and sort of most obvious way, is that we are a non-profit organization, and so, we’re funded in several ways, but especially by donations. So we would always welcome donations, either just one-time donations to our efforts; regular donations are a possibility for donors who might be able to do that; and then also funding a specific project, providing funds for a specific project, which you might be interested in seeing happening. In addition to that, we would love to have individuals help us with getting works out there; with maybe doing an event in their parish to raise awareness about what we’re doing and to help with getting our books sold; to talking with people about our mission. And even if you were just to run across someone, who is interested in doing translations or who knows about some works out there, to send them our way, so that we can begin talking to them. I know in our contemporary culture, there are lots of challenges to us living in the 21st Century. In many ways today, the challenges that people run up against in Moscow and in Seattle and in Mexico City have a lot of similarities, especially because more and more we’re sort of a global culture. And so, it really is our desire that we might share those across our Orthodox community – how we can learn to live in today’s culture and really share our wisdom across the boundaries. So even just sending people to talk to us is a great idea. Bobby Maddex: And I assume, Erin, that the best way to do that is through the website. They can get in contact with you on the website? Erin Moulton: You can email us directly through our website. So there’s a contact form there where you can send an email to us directly. Bobby Maddex: Okay. Jodi, why don’t you talk to us here, just for a second, about the importance of the work of Orthodox Christian Translation Society? Why is doing what you and Erin and the rest of your board and various translators and volunteers, why is this work important? Jodi Elliott: Well, I believe, as I think most Orthodox Christians do, that the Orthodox Faith is a treasure and the most important thing in my life, so I want to see it shared throughout the world. I think a lot of times missionary efforts have been stymied by not enough work going on in the vernacular that people can understand – both liturgically speaking and also edifying texts that they can read in their own language. As a convert to Orthodoxy, I’ve run into this in different places where you want to learn, and you’re hungry to learn; you found out a little bit about Orthodoxy, but you want to know more, and you run up against barriers and blocks, because things aren’t translated. I worked for a brief time at Project Mexico in the late ‘90s. Back then, we were doing a lot of liturgical translation on the fly, just to be able to have services for Holy Week and Pascha. There’s translation efforts that go on all over the world, but they’re not enough. They’re not coordinated, and they need more support. And I feel like there’s a lot of people out there that would like to see this kind of work go on. And they just need somebody to make sure it’s happening, and that’s why we exist. Bobby Maddex: Alright, Erin, is there anything else that you would like to add before I let the two of you go today? Erin Moulton: Sure. I guess one other piece that I would just add, that’s good to think about in all this, is that a piece of all this is the translators themselves. So as a Church, we have a great gift when we have members of our Church who have the gifts and the abilities to do this kind of work. One of our visions of this has always been that there should be a way for us to support people who have translation abilities, so that they can give their time to the Church to do this and still support their families. So, for example, our translator for the first work, Place Your Hope in the Lord is the mother of five young children living in Serbia, and it makes a big difference to her if we can start finding ways that she can use her gift, both for the good of the Church, while at the same time being able to raise her own family and support them. So, that’s sort of another piece of our effort is just all working together, as the Body of Christ in the Church, to support each other. Then, we sort of care for all of us in this process. Bobby Maddex: Alright. Why don’t you give that website one additional time to make sure that listeners know where they can get ahold of you? Bobby Maddex: Well, Erin and Jodi, I thank you so much for taking some time to talk with me today. Jodi Elliott: Thank you very much. I really appreciate the time to be here with you. Bobby Maddex: Again, I’ve been speaking with Erin Moulton and Jodi Elliott of the Orthodox Christian Translation Society. I’m Bobby Maddex, and this has been a listener-supported presentation of Ancient Faith Radio.